In a week with new alarming antibiotic-resistent superbug news (here) it is nice to know that least some people make the effort to make new antibacterial drugs. The synthetic target this week is a sesterterpene of the ophiobolin family and its creators Brill, Grover and Maimone of the University of California at Berkeley report about it in Science (DOI). One of the key reactions (depicted here) is bioinspired. In nature cyclase enzymes stitch together ophiobolins from smaller terpenes in cationic cascade reactions. This reaction is a radical variation. 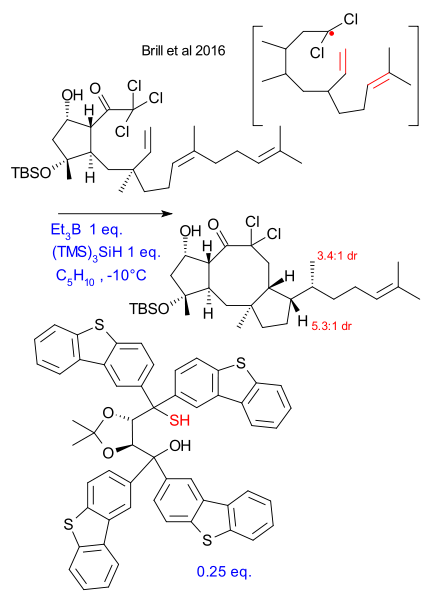 The reagent system triethyl borane and tri(trimethylsilyl)silane makes the reaction look like a Barton-McCombie deoxygenation with TTMSS replacing the stannane. The TADDOL catalyst is huge and not used in moderation and even then the stereochemistry is not perfect. This thiol catalyst is believed to deliver the final proton and was the only one among a range of candidates to do this in the most desirable way.